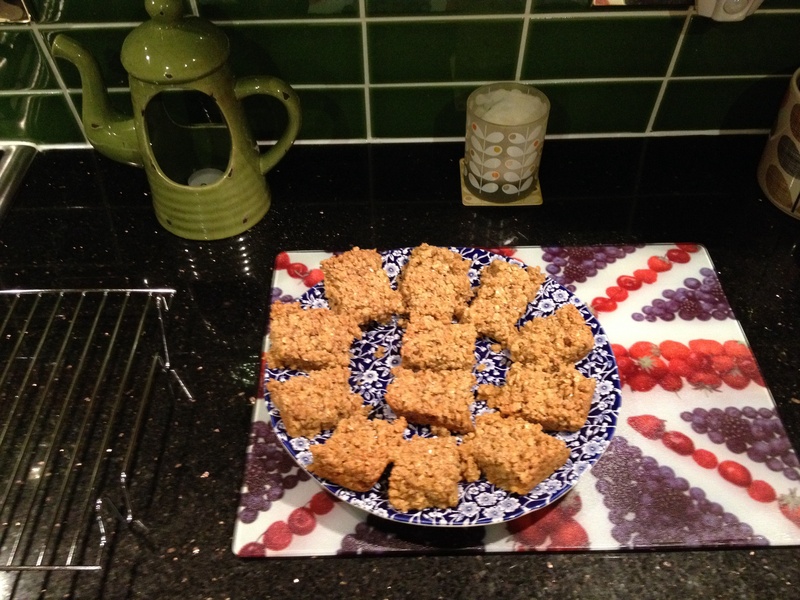 Made these flapjacks which were very simple to make. They went down a treat with the neighbours! Make the sauce: Peel the onion and carrot. Trim the celery and give it a wash if it looks muddy. Chop the vegetables fairly finely. You need roughly equal quantities of each. Set the prepared vegetables to one side while you get ready to fry the meat. Turn the meat over with the wooden spoon to let the other side brown in the same way, breaking up the lumps with the back of your spoon if necessary. When you think it’s cooked enough, use the slotted spoon to transfer the meat from the pan to a bowl or plate at the side of the stove. Turn down the heat. Add the butter to the pan. Add the onion, carrot, celery, and a good sprinkling of salt, and stir them into the butter, scraping up all the meaty bits that have stuck to the bottom of the pan. Put the lid on and let the vegetables “sweat” over a very low heat for about 10 minutes, stirring from time to time, until they soften and seem to shrink. Peel the garlic and chop it very finely. Add it to the pan and fry the mixture a minute or two longer. Add the tomato purée and bay leaves, then grind in some pepper and give everything a good stir. Return the meat to the pan and pour in the wine and stock. Stir in the milk. Bring the mixture to a simmer, cover the pan with the lid, and keep the heat very low so that the ragu cooks very gently. Stir from time to time. It should bubble away for at least an hour, preferably two hours. At the end of the cooking time, taste a spoonful of sauce — does it need more salt and pepper? Remember, though, that you are going to be cooking the spaghetti in quite salty water as well as perhaps adding salty grated Parmesan. Make the pasta: Fill a large saucepan three-quarters full with water and bring to a boil. Just as it comes to a boil, add a tablespoon of salt. Add the pasta to the pan and stir the water gently until all the pasta is submerged. Set the timer for a minute or two less than the cooking time on the pasta package, but remember to stir it every now and again. Stand a colander in the sink. 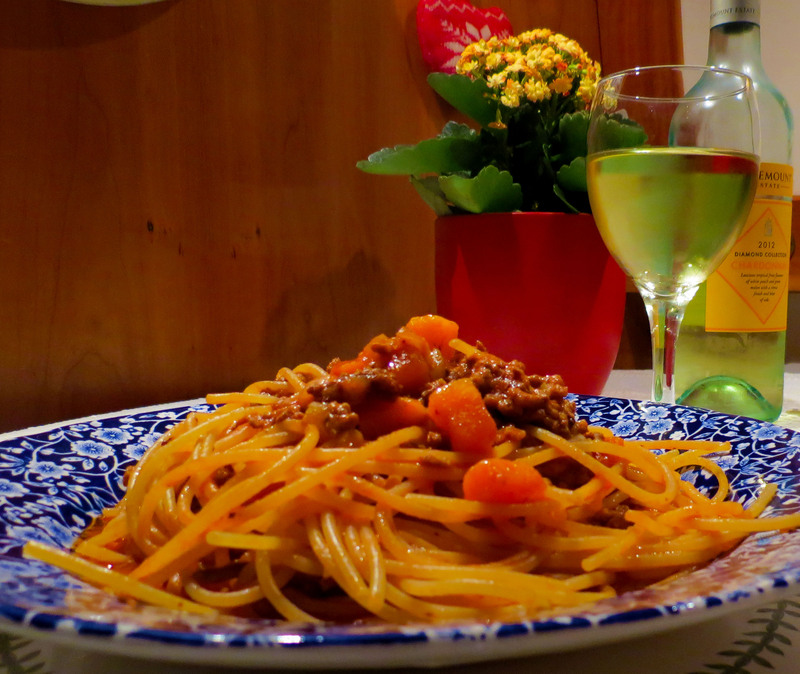 Taste the pasta and, when you’re happy that it’s cooked as you like it, carefully drain it into the colander. Then pour the pasta back into the pan and add the sauce. Stir well and serve, handing around the Parmesan cheese and the grater.